Running on Empty? 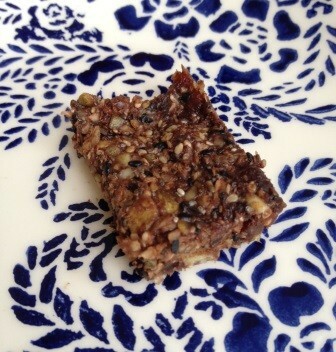 Make Your Own Energy Bars. Posted at 8:34 pm by Yummytums! If you work out regularly, chances are that you’ve purchased more than your share of energy bars. I know I have. In keeping with my desire to eat whole foods and limit the amount of processed ingredients in my diet, I decided to try an energy bar make-over. One look at the ingredient list in a processed bar might convince you to do the same. 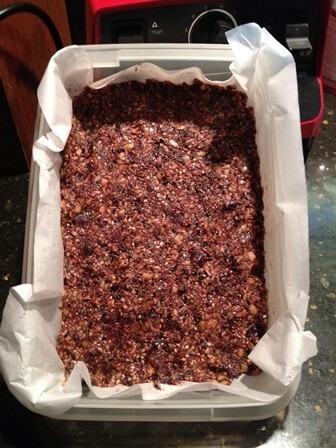 As it turns out, making your own energy bars is easy. It can be a little messy, but you’ll end up with a better-tasting product, minus the strange fillers. Here’s a starter recipe for you. I actually halved this because I was running low on one of the ingredients. In a food processor or high speed blender, pulse the dry ingredients quickly. Don’t over-process, you want it a little crunchy. 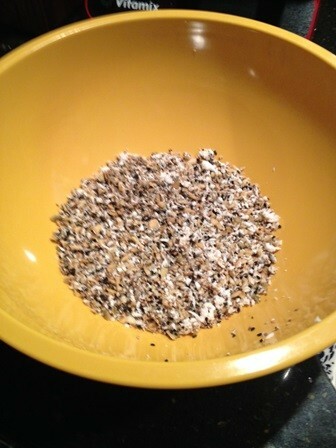 Place the mixture in a bowl and set aside. It will look a little bit like bird food at this point! Add half of the dates and the rest of the wet ingredients to the food processor. Run the processor for 30 seconds, then add the rest of the dates one at a time while the machine is running until the mixture is smooth. You might have to help out by stirring around a few times with a fork or adding a dash of water. I added a little bit of sorghum for both sweetness and moisture. Pour the wet ingredients over the dry ingredients and stir until well combined. You might need to use your hands to mix this up well. Press the mixture evenly into small baking dish, making sure it becomes quite compact. Place in the fridge for about 30 minutes. Cut into bars. Wrap them in paper and store in an air-tight container. The bars will keep around a week in the fridge.